With over 100,000 people expected to descend from the sun-deprived corners of the universe into the depths of the Indio Valley in just a few days, Coachella 2019 is sure to be the greatest Coachella yet. The music festival season is officially OPEN for business! While we eagerly (but patiently) wait for all the final details to be announced, we’ve been flashing back to Coachellas from the past. And have begun our preparations. Why is it so sandy and dirty?!?!?! But you know what - it is what it is. I dove deep into the edm-files to find some lessons learned to share with you, today. 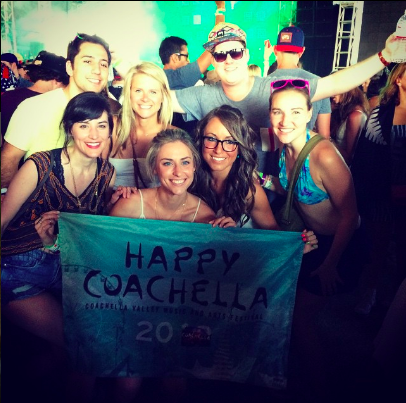 The crew at Team Fanny has over 10 Coachellas in their name. We saw a young snapback sporting Kygo going head to head against a no-show Drake on a Sunday night; the Pac hologram thing; and experienced the surprise guests that have come to mark Coachella. So, we thought we'd share some ideas with you to ensure your Coachella survival kit is stocked and ready to go. Let's do this! We still haven’t figured it out but with all the pulsing, jumping, running, frolicking, dancing, mid-day pilates in the sun and happy feet this venue gets absolutely destroyed by the end of the weekend. Sand kicks up and into your lungs. Be prepared with a face mask. Breathe happy. With each long, sunny happy day you’ll find yourself texting, calling, selfie-ing, taking photos and video’ing your way through the venue. I mean - look at this beauty we captured of our crew back in the day. But remember your portable charger! (Complete with the random photo-bomber). Now think how upset I would've been if my phone died and I didn't grab a picture with my girls and the random photo bomber. It’s California. In April. And it’s sunny. For those of who may have spent the latter half of the winter in the Northeeast counting down the days until Coachella you may have forgotten that other parts of the country do see the sun. It’s bright. And your eyes will thank you with some sporty sunglasses -- perhaps even some foldable ones. Your fanny pack that is! You’re going to need to put all your stuff somewhere and let’s face it, times are tough in the “what bags are allowed” world. With increasing security scrutiny you’re going to want to bring a bag that you know will be allowed into the festival. Coachella has confirmed that fanny packs are a yes for 2018, so dance on, with your cute fanny pack. And if you have questions on other Coachella FAQs, we’ve got you covered. While we all appreciate when the beat drops, your ear drums might not. If you happen to get all snuggly with that oversized speaker meant to be felt all the way to Paso Robles you’re going to want to some protective gear. Be prepared. Be ready. Be happy. It will get nasty and sometimes you’re going to want to wipe down -- whether it be from that hot, sweaty dance party, some spilled beer or a weird combination of sand sweat. Be clean. Is it less than 40 oz? Perfect, you’re all set! You’ll be filling up all weekend and your Saturday morning hangover will thank you for hydrating. No one likes getting burnt - on accident. Avoid that awful first day burn with some non-aerosol sunscreen (no aerosols allowed inside) and focus on having fun. Remember, while this is a happy gathering you will feel like you are in the middle of a fashion show, at times. You may be there to party; you may be there to strut; you may be there to get weird; but you’re going to want to look sweet either way.